Jessi and I recently discovered a new iPhone app that's pretty sweet. The iPhone app is called RoomScan by Locometric and it creates floor plans without you needed to get out your tape measure and graph paper. As a landlord, I use floor plans for a couple of things: to plan rehab projects and give perspective residents an idea of what the dwelling looks like before they drive all the way over to the property. My previous process was to grab a tape measure and open Google's Sketchup on my computer. I would then walk around, measure everything and input it into the computer. This process can take HOURS. I first read about RoomScan on LifeHacker and downloaded it. Recently I had a chance to use it in ernest. There is a free version you can try, but think of it as a demo to decide if you want to buy the Pro version because you can't attach rooms and can only keep 4 rooms total. RoomScan Pro costs $5 and is worth it because it has all of those extra features. To get the floor plan, all I did was take the phone and put it up against the wall. The app beeps and I move to the next wall. I went all the way around until I created a full loop. Where there is a door, you can easily add with a tap. When you finish, it creates your floor plan with the doors. You can then tap on one of the doors and use that as your starting point for the next room. You can easily do a whole house in 30 minutes. Here's a demo video showing how it works. Here's an example of what a single room looks like right after you scan it. I think it's cool that it shows you where you walked (the dashed lines are the position of the phone). Pro tip: if you accidentally drop your phone, you'll need to start that room over because the phone is tracking your movements and the end result will be funky. It also means you want to keep the phone steady throughout the measuring process and not wave it around a bunch while walking - give technology a little help! 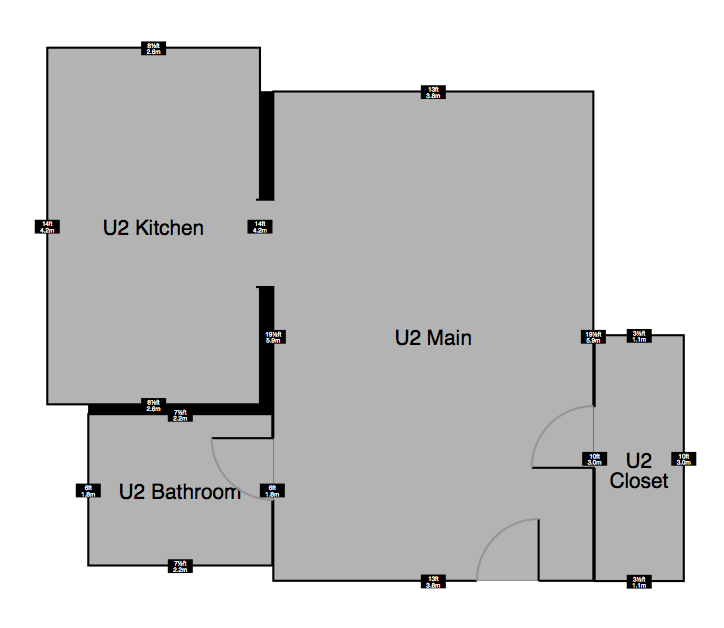 Here's what a final floor plan looks like with all the measurements. Within the app, you can make adjustments to each room (both in size and position), change the output colors, and add windows. There are also multiple output types. I did a PDF export and then converted that to a picture. In the PDF, the perimeter numbers are readable because it's a better resolution. It's a pretty cool app that's worth checking out if you find yourself doing floor plans with any regularity.